From left: Myfanwy Emeny, Manager Parks and Reserves; Deputy Mayor, Jill Day; Volunteer Danielle Saunders; Claire Bibby, Glenside Progressive Assn. Inc. and Councillor Peter Gilberd. 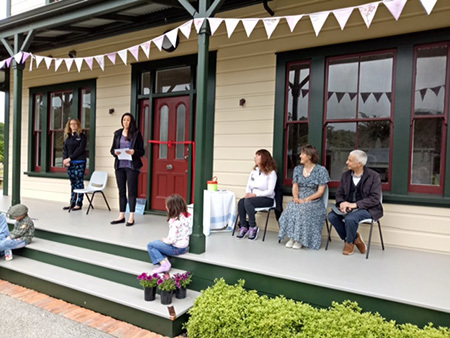 The historic Halfway House at Glenside was officially opened on Sunday, 29th October, when Deputy Mayor Jill Day and Claire Bibby, President of the Glenside Progressive Assn. Inc. cut the red ribbon midst applause. In her opening speech, Deputy Mayor Jill Day acknowledged the partnership between Council and community to bring the vision to fruition. She read out the names of staff at Wellington City Council who had key roles in the restoration. Claire Bibby, President of the Glenside Progressive Assn. Inc. and leader of the Heritage Gardeners spoke about the history of the Glenside Halfway Houses since 1841 and the people who occupied them. She praised the efforts of the Glenside residents, who worked tirelessly over many years to retain the house in Council ownership for community use and acknowledged the work of the Heritage Gardeners to create a Victorian farm garden. Cnr. Peter Gilberd thanked the Glenside community for their partnership with Wellington City Council, describing it as a "showcase"of how a Council and community partnership should work. He said the house would provide a destination for people in the 'haven of green' reserve land. Councillor Malcolm Sparrow affirmed his words. More than 331 people signed the guest book. 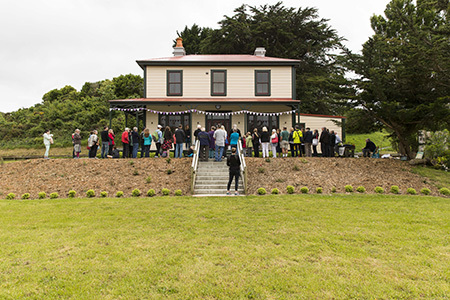 The Richardson family, who lived in the house from 1944-1956, travelled across from Australia for the opening. People travelled from Palmerston North, Levin, Waikanae and Masterton, as well as from the wider Wellington area and local suburbs. People signing the guest book were asked "What brings you here today" and the most popular reason was history, heritage and love of old houses. The house was filled with flowers. Photographs and stories of people who lived in the house were placed in the rooms. Upstairs was a historic photographic display prepared by the Heritage Gardeners and Glenside Progressive Assn. Inc. An interactive space provided people the opportunity to suggest how the house and garden could be used in future. Donwstairs, the Onslow Historic Society had a sales table and sold historic books about the local area. The Heritage Gardeners had a plant sales table, and placed interpretive signs in the garden for people to read as they wandered in the grounds. The Glenside Riding Club had horses available for people to pet. $595.70 was raised through door entry donations. This money will go toward framed historic pictures, for example, the 1849 Halfway House, and the 1846-1849 map of the Halfway House. These will be hung in the community front rooms. $152 was raised by The Heritage Gardeners and will be used to buy heritage plants for the garden. Twigland Gardeners World have offered to help out with these purchases.